Will Hofstadter comes off the blocks. The freshman was one of the many underclassmen swimmers who helped Northwestern to an eighth-place finish at the Big Ten Championships. 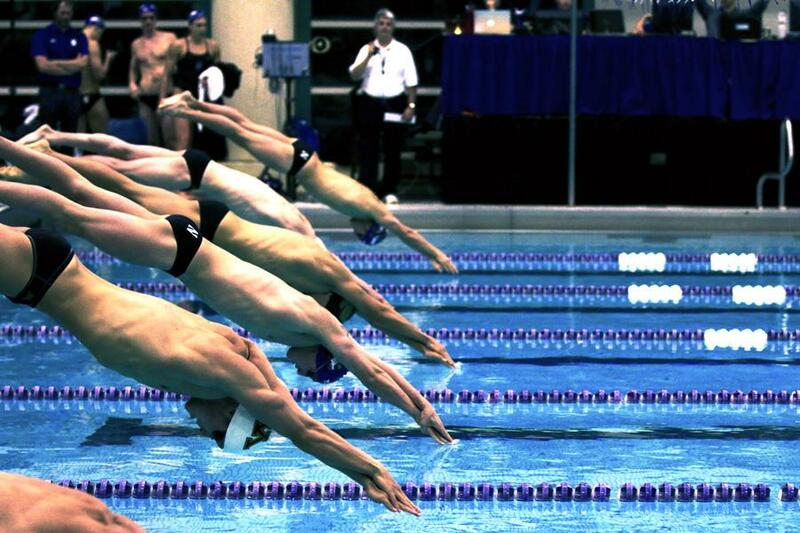 Northwestern failed to qualify any swimmers for A-finals at the Big Ten Championships this weekend, but the meet was still one of its best in years. After a five-year streak of ninth place finishes, the Cats managed to improve to eighth this year, their best finish since 2009. NU scored 462 points over the course of the seven session meet, as Michigan won its sixth consecutive Big Ten championship with 1,475.5 points. Junior Andy Jovanovic finished second in the C final of the 200-yard backstroke on the meet’s final evening. His time of 1:44.60 was good enough for 18th place overall, and was the fastest time by an NU swimmer this season in the event. Freshman Tyler Lis and redshirt freshman Anthony Marcantonio also competed in the 200 back finals. Lis’ time of 1:44.74 took fifth in the B final and 13th overall, while Marcantonio was fifth in the C final. Lis also swam the 400-yard Individual Medley and left his mark on the record books there. After swimming a career best 3:51.37 in the preliminaries, Lis took second in the C final with a time of 3:50.71. His finals time is the fourth-fastest in school history, just beating out Jordan Wilimovsky’s 2015 time of 3:50.75. Marcantonio continued his streak of incredible swims in the 200-yard freestyle. He set a new personal best in the event in each meet in January, ultimately dropping to a 1:38.62 against Minnesota and Purdue on Jan. 29. In the preliminaries at Big Tens, he broke his personal record again, swimming 1:36.81 to qualify for the C final. He ultimately finished second in the C final, and 18th overall, with a time of 1:36.88. On the diving boards, junior Andrew Cramer stole the show for the Cats, competing in the B final for all three diving events. Cramer’s best finish was tenth overall from the 3-meter springboard. His score of 368.90 points was good enough for second in the B final, but would have been the sixth place score in the A final. Cramer finished thirteenth and fourteenth overall in the platform and 1-meter springboard, respectively. “I didn’t do as well as I would have liked, but I had probably the best list I’ve ever competed on for three meter in the final,” Cramer said of the dives he attempted. Cramer and his teammate junior Reed Dillon will both return to action this weekend at the NCAA Zone Diving Championships, and will look to qualify for the NCAA Championships March 24 to 26 in Atlanta. On Sunday, after the meet concluded, the Big Ten’s swimmers competed in a long course time trial for the opportunity to earn Olympic Trials cuts. Nine NU swimmers, including Wilimovksy, who is training for the Olympic open water 10 kilometer race, have now qualified for Olympic Trials in 13 different events. The Cats’ best showing at Big Tens in years came in large part thanks to the team’s underclassmen, with 9 of 22 swimmers members of the freshman class, and gives the team a positive outlook for the future.